What do you see when you hear ‘New York’? Gleaming skyscrapers? Yellow cabs? Buoyant nightlife? Trendy dudes? Probably. But here I’m going to write a few words about the other New York, the New York State. Sure, it is home to New York City where all those above-mentioned images are absolutely correct, but there is also, so called, “Upstate”, where forests, mountains, lakes, small towns and industrial heritage are the norm. And that’s where I entered the state. Not via one of the bustling airports or traffic choked highways of NYC, but by crossing a small bridge from Vermont across Lake Champlain. You could say it was the proverbial middle of nowhere; just farms on the Vermont side of the lake and forested mountains on the New York side. It was getting dark, fog had started wrapping the hills and the whole landscape was as rural as you can get. My first stop was the town of Ticonderoga. Surprisingly the chain hotels were all full but they directed me towards some older independent motels. The one where I finally stayed looked like it was straight from the 50s, judging by its look and décor, but its owner was super-friendly. The wi-fi didn’t work but he was so apologetic that I just couldn’t go anywhere else. And I got a discount too. The next day the sun was shining and I hit the streets of Ticonderoga early. Or rather one short main street to be precise. Just a few blocks and two sets of traffic lights. But that was enough to have a good local luncheonette where I treated myself to a truly awesome breakfast. After which I was ready to visit the main reason I was in this neck of the woods in the first place, Fort Ticonderoga. Built by the French between 1754 and 1757, it was of strategic importance during the 18th-century colonial conflicts between Great Britain and France. It again played a role during the American Revolutionary War as it controlled an important route between the Hudson River Valley and the Saint Lawrence River Valley. Picturesquely located on a peninsula at a narrows near the south end of Lake Champlain, the fort is nowadays lovingly restored. Or actually it is more of a reconstruction because not much is left of the original fort as it quickly fell into ruin after the Revolutionary War. Luckily it was acquired by the Pell family who started its reconstruction as early as 1909 which makes it one of the oldest preservation projects in North America. Nowadays you can wander around the fort by yourself or join one of the tours led by the period dressed guides. I would recommend the second option as these guys are really knowledgeable but also have a good sense of humour. You will laugh during the tour. They also offer musket firing and other presentations. The best way to fully appreciate the layout of the fort is to have a look at it from the nearby Mount Defiance. It is just a 10-15 minute drive but it is a bit tricky to get there, make sure to get the leaflet with the precise directions from the museum store. And then don’t get scared when the road gets rough. It is steep, narrow and full of potholes but the view from the top is amazing. You can clearly see the fort as well as big swaths of Lake Champlain, Green Mountains in Vermont and Adirondacks in New York. From Ticonderoga I headed south to Albany which is the capital of the Empire State. That’s correct, it is not the Big Apple but this rather smallish city which is the capital. There are different explanations why this is the case (and I’m not sure which one is correct), but it doesn’t really matter. What matters is the fact that Albany is a rather unique place. For a start, the state capitol has a bit of an unusual shape as it lacks a dome. Apparently there were plans for the dome, and even a tower, but during the 32 years of construction it was discovered that the weight of the building was causing it to shift downhill as well as some fractures. So, no dome then. In effect the building looks like an oversized château from the Loire valley, kind of out of place in Upstate New York. If the capitol is a bit out of place then its surroundings are absolutely bizarre. 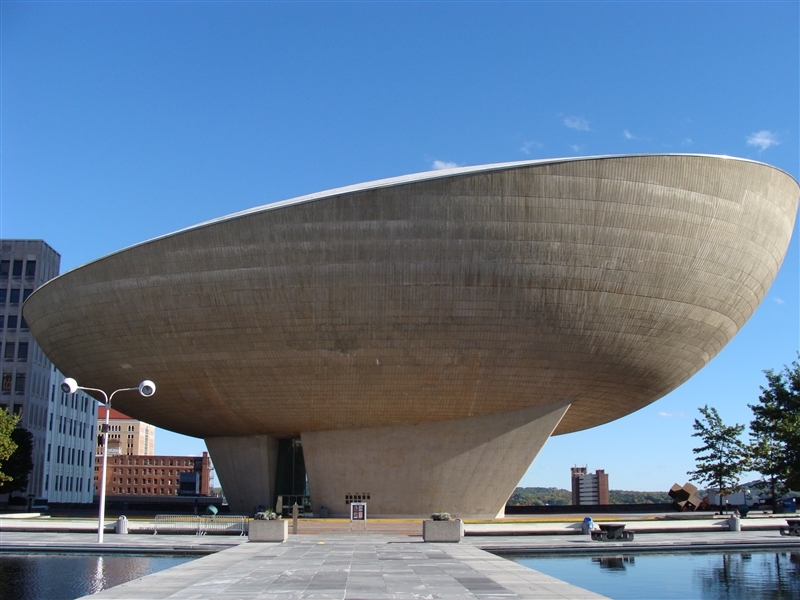 The Empire State Plaza is a complex of state government buildings located immediately south and south-west of the capitol. Built between 1959 and 1976 it was the brainchild of Governor Nelson Rockefeller and it is huge. It consist of various marble and steel buildings set around a row of three reflective pools. On the west side there is a row of four identical, so called, Agency towers which are 23 storeys tall. On the east side there is the 44-floor Erastus Corning Tower and the performing arts venue called “The Egg”, named for its shape (you will know why once you see it). On the south end (opposite to the capitol) there is the Cultural Education Center which looks so weird, it is hard to describe it in a few words. It is also big, with 1,5 million square feet (135,000 m³) of floor space. To be honest the whole complex looks and feels massively oversized for a city the size of Albany. But it is also absolutely fascinating and photogenic, especially on a sunny day. The best way to fully appreciate it, and to get an understanding of its layout, is to visit the viewing deck on the 42nd floor of the Corning Tower (which happens to be the tallest building in New York state outside NYC). From there you will be able to see all the government buildings located around the reflecting pool as well as the rest of the city (which feels dwarfed by the complex). Then there is the Hudson River and endless mountains and forest surrounding the city and stretching far into the horizon. Albany is an easy place to visit. You can leave your car in one of the vast parking lots underneath the Empire Plaza which are connected to the underground walkways connecting all the buildings. For anyone interested in grandiose architecture Albany is a must-visit place. Together with places like Brasilia or Canberra it is one of the largest purpose-built government complexes in the world. Some compare it to buildings built by Fascist governments and criticise its size and cost (it cost $2 billion and 9000 people were displaced during it construction). But there is no denying that it is an unique and well worth visiting place. From Albany I headed west towards the Finger Lakes Region in the centre of New York state. On my way I stopped for a night in Binghamton where, by coincidence, I also stayed 5 years ago on my previous trip to this part of the world. It is one of those nondescript towns where I usually end-up staying in cheap chain motels and eat in one of the countless fast food joints located on the endless strip-malls stretching for miles and miles. They are not highlights of any trip but I have seen plenty of similar places all across America and I think I even like them. I can’t explain why but I find them strangely fascinating with all the grittiness and anonymity. They all look the same, it doesn’t matter if they are in Michigan, or in Colorado, or in Kentucky. These are the places where everyone minds their own business and you can easily blend in. By and large no one will see you as a tourist. Tourists don’t visit places like Binghamton, but I would say that this is the real face of America rather than beaches of Santa Monica, theme parks of Orlando or boutiques of NYC. After Binghamton everywhere else would look beautiful and fascinating but the Fingers Lake Region is genuinely interesting. My time was limited so I only chose one destination to visit, the Taughannock Falls State Park. Beautifully located on the banks of the Lake Cayuga it is home to one of the tallest single-drop waterfalls east of the Rocky Mountains. Its main cataract drops 66 metres, which is a full 10 metres more than the mighty Niagara. You can hike to its base at the bottom of a long and narrow gorge (with walls reaching 120 metres tall), or you can take the rim trails which offer great views from the top of the falls. 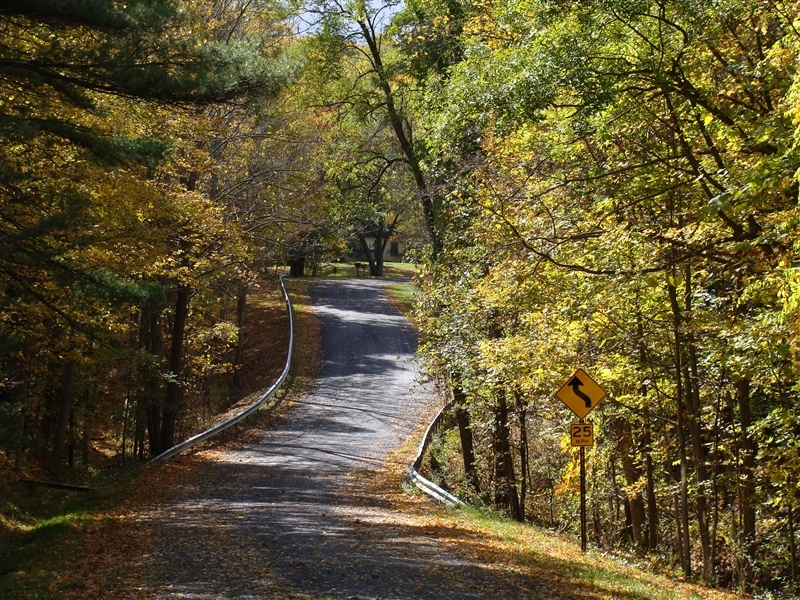 In other words, this small state park is a real gem. In fact, I suspect that in many countries in Europe it would be probably designated as a national park. This was the turning point of my journey. From Taughannock Falls I started heading back east, ultimately all the way to the hustle and bustle of the Big Apple. But that was still hundreds of miles away and for now I was simply enjoying a peaceful drive across the New York countryside. I would recommend Upstate New York to anyone visiting north-eastern USA. Even if you mainly come for the highlights of NYC it is well worth sparing a day or two to tour this fascinating region. This entry was posted in Uncategorized and tagged Albany, Binghamton, Erastus Corning Tower, fort ticonderoga, Lake Champlain, Mount Defiance, New York State, Taughannock Falls, The Empire State Plaza, Ticonderoga, Upstate New York on February 7, 2013 by admin.